I will tell you whatever I can about those five days. It is a morbid subject to pick for your final paper in history, however. I suppose I should be gratified in this renewed interest in your studies. Where to begin? They called the day of the start of the horrendous riots, Direct Action Day, the politicians that is their jaunty name for it. As if we were taking our fate into our own hands and molding our destiny. What rubbish! You know what action came about that day? I will tell you one thing, you were almost snatched out of my arms by a crazed Hindu woman, Devika, who had just seen her 14 year old son beheaded by a Muslim mob, and wanted nothing more than to do the same to someone else's baby. And take direct action. I knew this Devika, had laughed with her, bought bread from her for the club. Patience had advised her on the best way to style her hair. She wanted to look like Mumtaz Shanti, who was a Muslim, from that movie Kismet. Mere days earlier, this woman was calm, even happy, maybe, but while she hummed in her kitchen and made the bread for that nights meal, Jinnah was holding court from his house on Malabar Hill in Bombay and pontificating about a place he concocted called Pakistan and putting in motion -- for his own purpose -- sevents that would render this mother a monster. The fact is, even I didn't know how many had perished. But I am getting ahead of myself. The war was over, your father was gone. You were three years old and growing, it seemed, every night. The Duck continued as before. Some of the characters had changed. Patience had left for England as soon as the Germans surrendered. She married a soldier and moved to Plymouth. Before she left she came to say goodbye, but that is for another letter. The British started the painstaking process of taking stock. 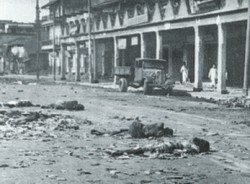 The war had all but crippled them financially and the agitation to end The Raj was reaching a fevered pitch. It was in this chaos that poor leadership was born and the corruption and selfishness of the politicians seeped into the psyche of the people. But I think this is what the British wanted all along. I know that is what Churchill thought. And the Congress and Muslim League provided much fodder. It was all some of us sensible ones could do to keep people from one another's throats. In the Duck we were such a mish mosh of religions, castes and what not. Somehow we managed. Our differences were not along religious lines, ever. It was always about personalities and living on top of one another. The usual human drama. It was during this time, that all of us, Adil Baboo, Asma, Madhu, Ghosh, and Rahul understood that we had been living in a bubble. This was our odd little family, of which I was the matriarch. Without realising it, I had created a sort of mini-society that was almost idealistic, utopian if you will, and therefore when the riots erupted, no one was more shocked than the staff and occupants of Bombay Duck. On the morning of August 16th, Rahul and Adil Baboo came rushing into the club. They had gone to their usual tea stall on Harrison street-- East Bengal Cabin. It was run by a very nice gentleman by the name of Nanda Lal whom I had known for years. He was dignified and well educated. Adil Baboo and Rahul said that Nanda Lal's tea stall had been burnt and vandalised and that he and his family were trapped in their own house and were fighting back. Nanda Lal had been attacked as well and was wounded. “Who are they fighting?” I asked. “Muslims,” Adil Babboo replied. “From Mirzapore Street.” He looked crestfallen. Adil Baboo later told me that they had barely escaped. A crazed mob had demanded to see if Rahul was circumcised and when he refused, fell upon him with broken bottles and lathis. Adil Baboo had stood between the boy and the mob and offered to show them that he was circumcised. He told them that Rahul was his son and if a father was cut then it followed that a son would be as well. The mob did not buy this story but became momentarily distracted when Adil Baboo undid his dhoti and obligingly showed them. Somehow it worked and he and Rahul escaped. On the morning of August 17th, when Devika ripped you out of my arms, she did not see me anymore, and I did not see her. I saw a rakhosh, Ma Kali at her worst. She was running down the street, a mad look in her eyes. She was covered in blood, none of it her own, I found out later. Her son's blood. She kept looking around, for something to kill. Rahul had ventured out earlier to see what was happening in the Hindu sections of town and told me that her son had been killed. I was overcome with grief for her. But I shut the door on her face. She banged on the door, screaming to let her in. I thought Madhu was right. The woman was a mother like me. It was Devika. The woman who sold us her bread. I opened the door. She stood on the steps, her chest heaving. She walked into the room slowly. We all parted to let her through. Her eyes were wide as she looked at all of us. No one said a word. She smelled like the streets after kurbani eid. But this was not cow's blood. Human blood, which is what she was covered in, smells sweeter. It was nauseating. Death had followed her into the Duck. My eyes instinctively went to where you were sleeping, in my room at the top of the stairs. Devika had been staring at me so she saw where my eyes went and she knew at once what I was feeling. She moved so quickly I almost did not beat her to the stairs. I screamed, “No!” and ran up the stairs, two at a time. She was on my heels. Someone, Madhu, I think, tried to grab Devika's sari, but she kicked at Madhu hard and she fell back on top of Adil Baboo and Rahul, who were also trying to get up the stairs. I tried to shut the door in her face, but she was so strong, Akash. She was a small, slim woman, but she was now overcome with superhuman strength. It was adrenaline brought on by grief and rage. She pushed the door in and I fell to the ground. She locked the door. Her movements were slow and deliberate. I grabbed her ankle and kept her from snatching you from the bed. You were awake now, sitting up and staring at me and Devika struggle on the floor. It was a silent, eerie struggle from what I remember. I was so close to her I could smell her sour breath. Adil Baboo, Rahul and the others were at the door, trying to break it down. I managed to shove her away and get up and grab you. You started crying then. Devika took a fistful of your hair and tried to yank you out of my arms. You screamed, I slapped her, but she would not stop. Finally, Adil Baboo and Rahul broke down the door and pulled her off us. They held her back as she snarled at me. Like a beast. Madhu took her by the hair and threw her down the stairs. She lay at the bottom, whimpering. Asma took you and went to her room where she locked the door and tried to comfort you. We all stood and watched to see what Devika would do. Eventually, she got up and limped to the door and walked into the street, which was now overrun with broken bottles, dead bodies, and people running around screaming. Rahul quickly ran down the stairs and slammed the door and barred it against the din.